Not content to merely show Americans what food to eat, Food Network has also spent the last couple of years slowly infiltrating sports stadiums with FN-branded concession stands. (You may remember reading about the one they operated at Yankee Stadium.) Well get ready, fans of both baseball and Bobby Flay. 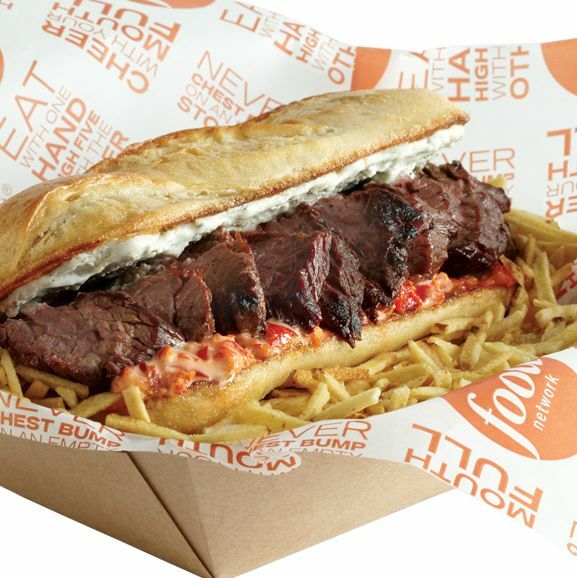 The network sends word today that the latest phase of their stadium takeover will see signature Food Network steak sandwiches popping up at ballparks around the country. When the 2011 baseball season kicks off next week, fans in Cincinnati, Cleveland, Detroit [Editor’s note: Go Tigers! ], Arlington, St. Louis, Milwaukee, San Diego, and Baltimore will be able to buy not only a blue-cheese steak sandwich called the Red, White & Blue Steak Sandwich, they’ll also be able to get sandwiches with toppings specific to their cities (sauerkraut and mustard in Cleveland, beer cheese in Milwaukee, etc.). No word on why they won’t be setting up shop at Dodger Stadium, but we’d wager a guess that it’s because no fan in their right mind would order anything other than a Dodger Dog.